The State University of New York at Albany (SUNY Albany) is a public university. 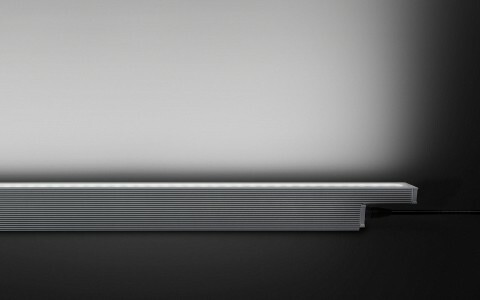 Lighting Dynamic developed a new lighting system that improves exterior light levels and reduces energy consumption. 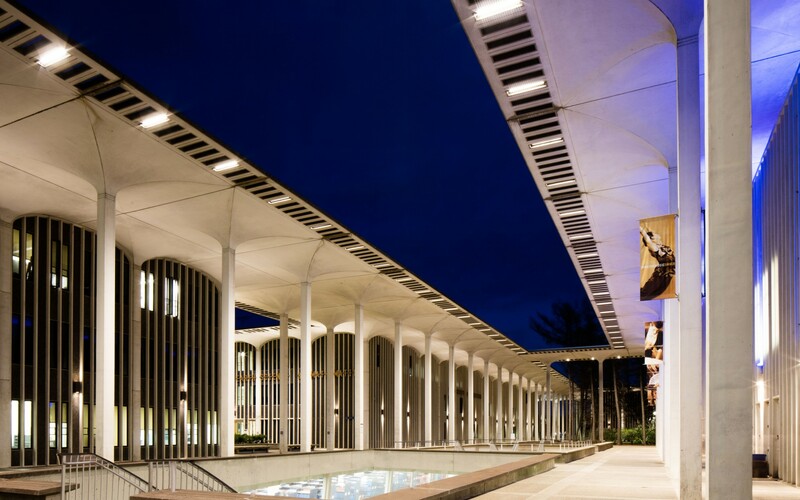 The firm chose Lumenfacade luminaires using a wide beam distribution. The linear form fit perfectly into the precast concrete recess that made up the roof canopy. The fixtures’ 60° x 60° beam spread permits an even flood of lighting down from the canopy above. This makes the fixtures essentially invisible when walking on the pathways. The new lighting system has breathed new life into the campus at large. 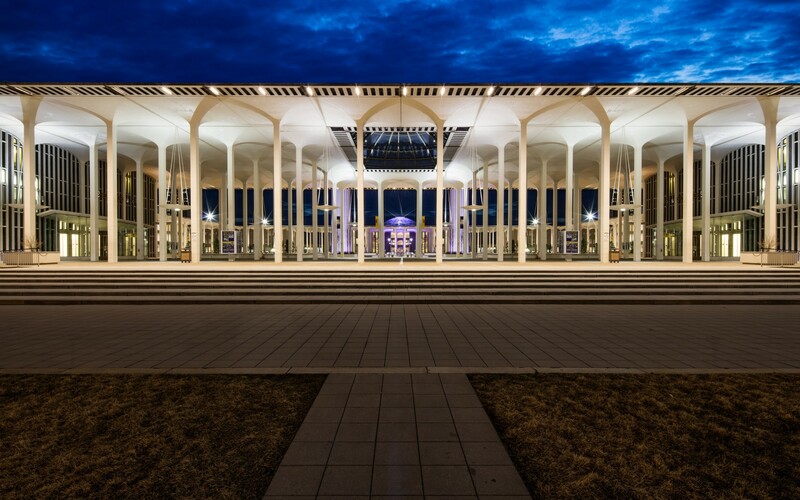 Lighting Dynamic, a division of M/E Engineering, used Lumenfacade luminaires with a wide beam distribution to provide even general lighting for SUNY Albany's exterior Academic Podium. This design solution helped to breathe new life into the entire campus. With the performance of the Lumenfacade fixture we were able to use the RO version, which allowed us to save energy and still get the lighting levels we wanted. 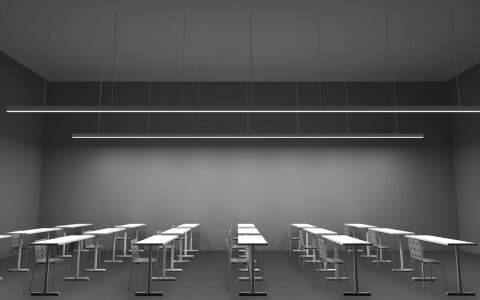 The fixtures’ ability to have a 60° x 60° beam spread permitted an even flood of lighting down from the canopy above. 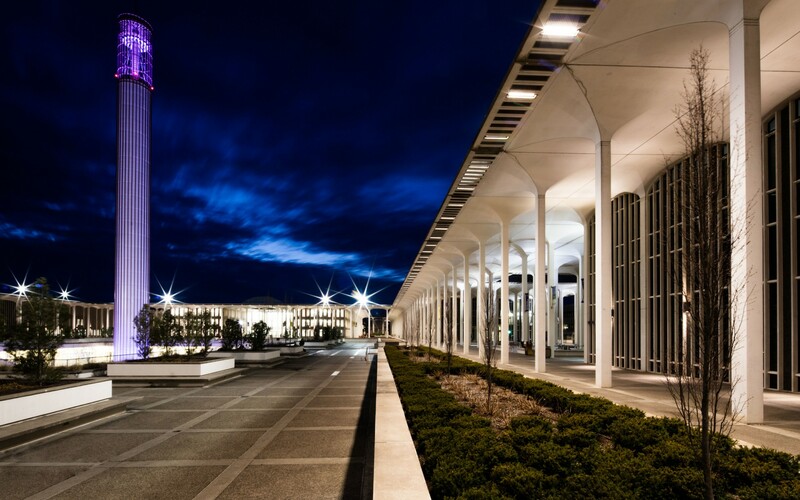 Founded in 1844, the State University of New York at Albany (SUNY Albany) is a research institution that provides undergraduate and graduate education, research and service. 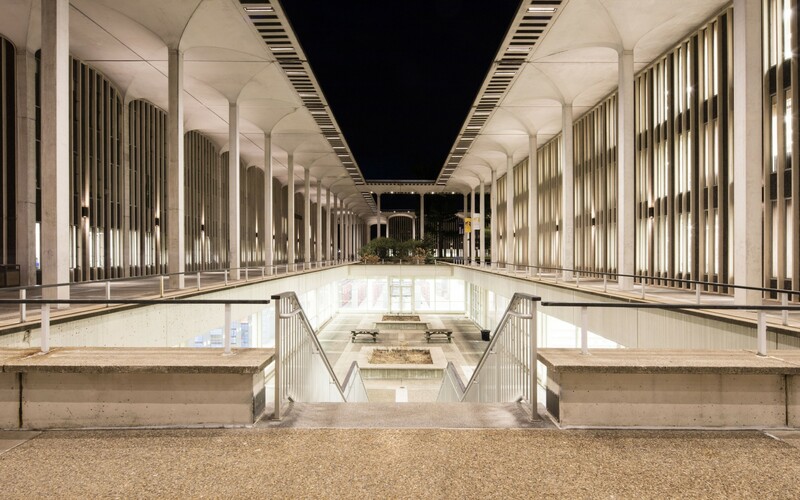 As part of an ongoing restoration and renewal program, the University turned to Lighting Dynamic to develop a new lighting system that would improve exterior light levels and reduce energy consumption at its Academic Podium, a 1.8 million SF complex housing 12 separate buildings. 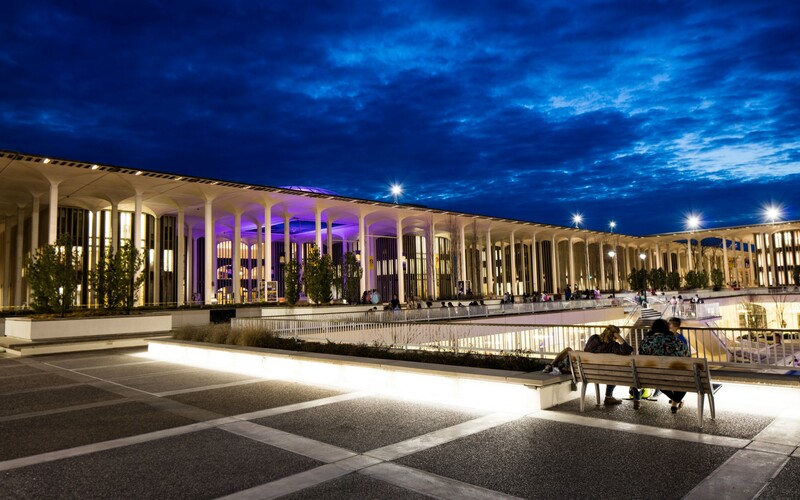 "The University had seen degradation in lighting levels and this sparked the need for a more modern, innovative lighting concept," says Robert J. Radley, Senior Engineer at Lighting Dynamic. 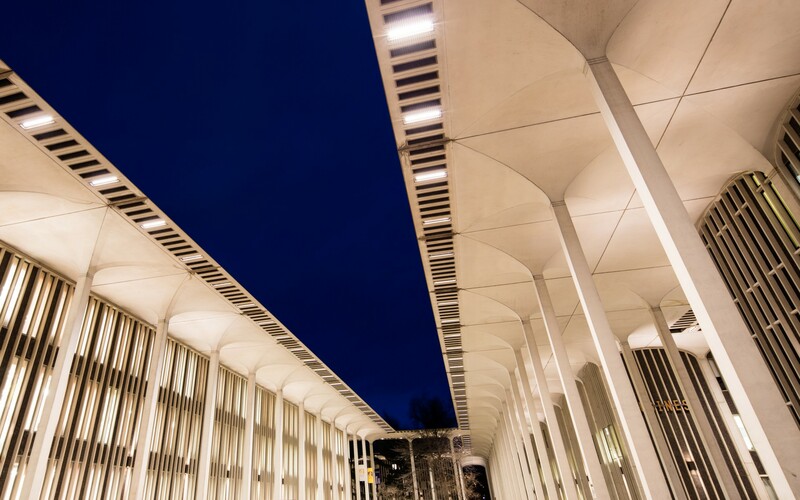 The firm chose to replace the Academic Podium's existing high-intensity discharge (HID) floodlights with Lumenfacade luminaires using a wide beam distribution. "The linear form fit perfectly into the precast concrete recess that made up the roof canopy and it allowed us to slightly recess the fixture so surface glare was not an issue," says Radley. 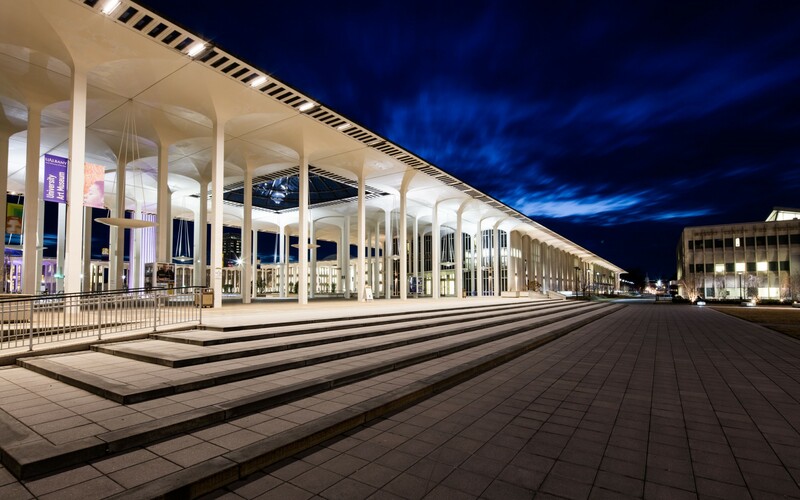 "With the performance of the Lumenfacade fixture we were able to use the RO version, which allowed us to save energy and still get the lighting levels we wanted. The fixtures' ability to have a 60° x 60° beam spread permitted an even flood of lighting down from the canopy above." Lighting Dynamic chose 3' Lumenfacade luminaires, spacing the fixtures 10' feet apart. "They were 10' apart because the even spacing pattern worked perfectly in existing recess locations. The fixtures were mounted above the canopy, so when walking on the pathways, they are essentially invisible," says Radley, adding that a custom mounted steel bracket system was developed. "This allows maintenance staff to clean the fixture lens, access cable connections and replace the fixture in the temporary upward state while standing on the roof. When maintenance is complete, the staff can then gently swing the fixture back into proper mounting location utilizing the guide pin and spring mechanism," says Radley. The new lighting system has breathed new life into the Academic Podium and the campus at large. "The reaction has been great," says Radley. "This project has proven that a simple change in lighting can improve the visual appeal and atmosphere of an entire campus."